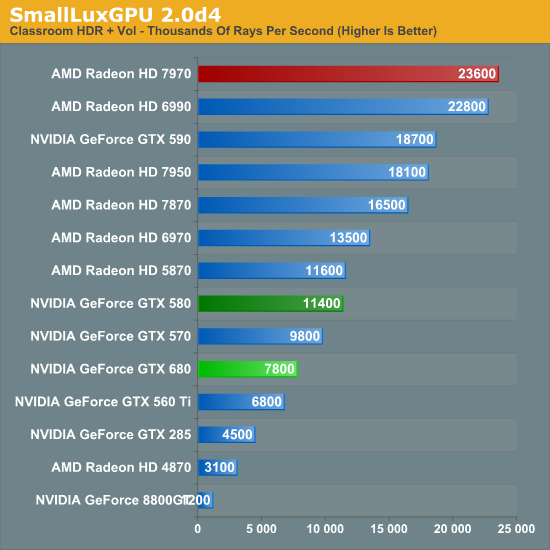 Many people have been blasting AMD for price vs performance in the GPU arena in the current round of fighting. The thing is, until now, AMD had no competition, so it was expected that the price would remain high until NVIDIA released their new generation. So, expect lower prices from AMD to be released in the next week. You also fail to realize that with a 3 month lead, AMD is that much closer to the refresh parts being released that will beat NVIDIA for price vs. performance. Power draw may still be higher from the refresh parts, but that will be addressed for the next generation. 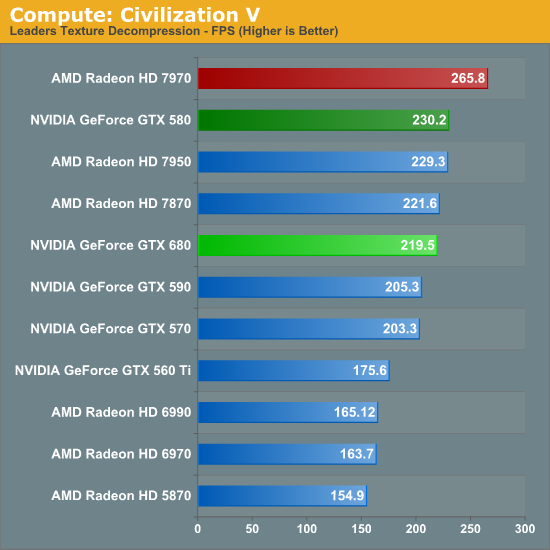 Now, you and others have been claiming that NVIDIA is somehow blowing AMD out of the water in terms of performance, and that is NOT the case. Yes, the 680 is faster, but isn't so much faster that AMD couldn't EASILY counter with a refresh part that catches up or beats the 680 NEXT WEEK. The 7000 series has a LOT of overclocking room there. Finally! Logic! But it still falls on deaf ears. We finally see both sides getting their act together to get minimum features sets in, and we can't see passed our own bias squabbles. How about we continue to push these manufactures in what we want and need most; more features, better algorithms, and last and most important, revolutionize and find new way to render, aside from vector based rendering. Lets start incorporating high level mathematics for fluid dynamics and the such. They have already absorbed PhysX and moved to Direct Compute. Lets see more realism in games! Well, the perspective I have is amd had a really lousy (without drivers) and short 2.5 months when the GTX580 wasn't single core king w GTX590 dual core king and the latter still is and the former has been replaced by the GTX680. So right now Nvidia is the asbolute king, and before now save that very small time period Nvidia was core king for what with the 580 .. 1.5 years ? That perspective is plain fact. FACTS- just stating those facts makes things very clear. I don't fail to realize anything - I just have a clear mind about what has happened. I certainly hope AMD has a new better core slapped down very soon, a month would be great. Until AMD is really winning, it's LOSING man, it's LOSING! So thanks for saying the GTX580 was never priced too high because it has no competition for 1.5 years. Honestly the only thing I was supporting was the fact he is showing that perspective changes everything. a fact exacerbated when bickering over marginal differences that are driven by the economy when dealing with price vs performance. Both of you have valid arguments, but it sounds like you just want to feel better about supporting nVidia. Ok Targon, now we know TiN put the 1.3V core on the 680 and it OC'ed on air to 1,420 core, surpassing every 7970 1.3V core overclock out there. 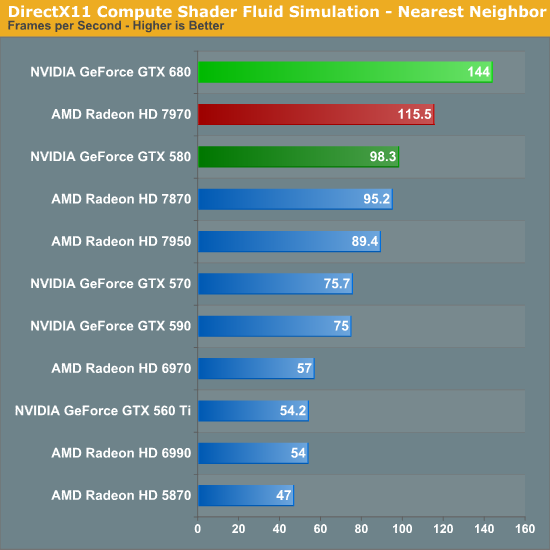 So it appears the truth comes down to the GTX680 has more left in the core than the 7970. Nice try but no cigar ! Nice spin but amd does not win ! In Crysis max, 7970 gets 36 FPS while the 680 only gets 30 FPS. Yes, some how the 7970 is losing. LOOK AT THE NUMBERS, HELLO!!??? 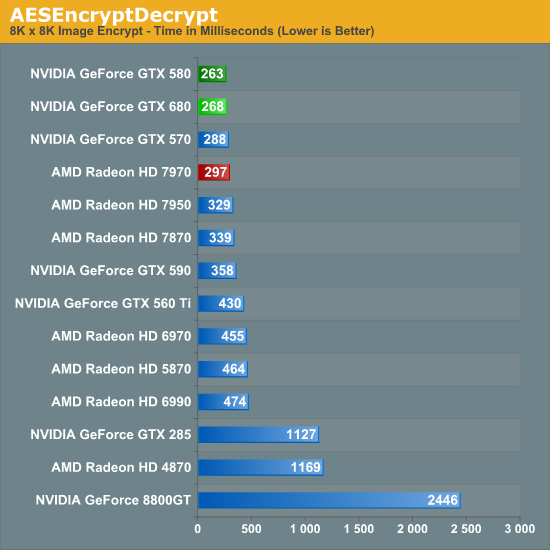 7970 kills it in certian GPU Compute, and has hardware H.264 encoding. "7970 kills it in certain GPU compute..."
Adding the word modifier "certain" to describe a win is like admitting defeat in every other compute situation. Even for the games, you can only mention 2 out of what, 6 games where 7970 wins by a <10% margin. 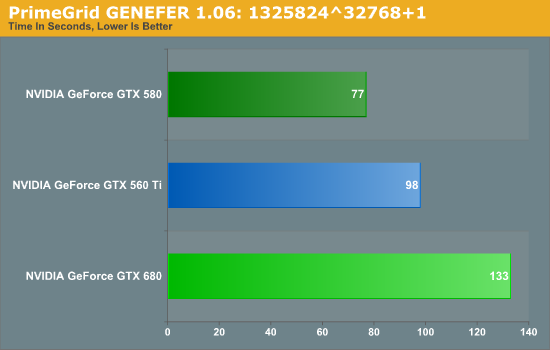 Meanwhile, GTX 680 proceeds to maul the 7970 by >15% in at least 2 of the games.